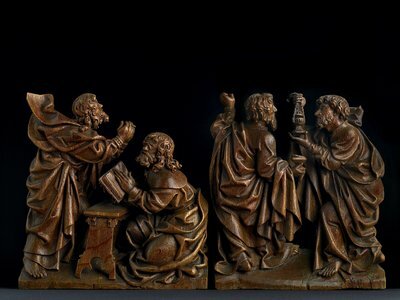 Museum Boijmans Van Beuningen is staging a special presentation of medieval sculptures from the Schoufour-Martin Collection from 9 September 2017 to 28 January 2018. The collection contains more than a hundred objects, three-quarters of them wooden statues. The exhibition is a tribute to Jacques Schoufour and his wife Ingeborg Martin, who for decades built up their collection with passion. 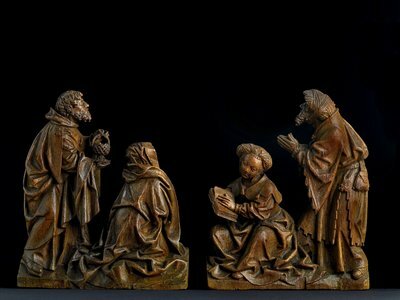 Their magnificent gift to Museum Boijmans Van Beuningen has doubled the museum’s collection of medieval sculpture. 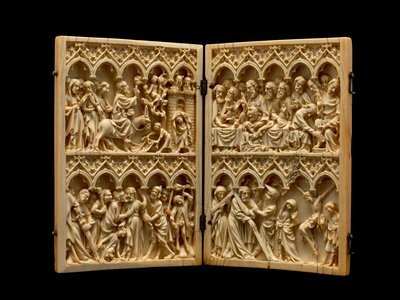 The earliest works in the Schoufour-Martin Collection include an early fourteenth-century Christ Blessing and two magnificent ivory diptychs from the end of that century. 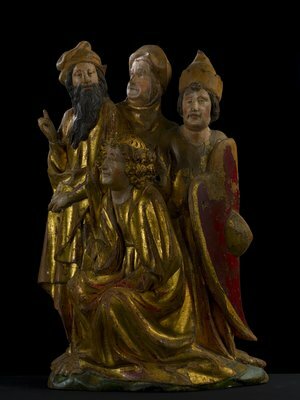 The major part of the collection dates from around 1500, with sculpture from Brussels, Antwerp and Mechelen at its heart. 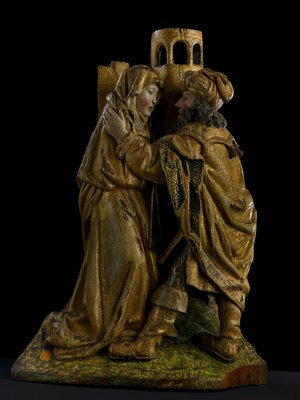 Two Calvary Groups (Bruges, c. 1410), Six Fragments from a Marian Altarpiece (Brussels, c. 1520) and The Meeting of Joachim and Anne (Antwerp, first half of the sixteenth century) are just three of the most important works. The exhibition was designed by the Rotterdam-based designer Vincent de Rijk in collaboration with photographer Frans Parthesius. After his wife gave the Rotterdam businessman Jacques Schoufour was small statue of St Martin in 1977, the couple developed a profound love of sculpture. 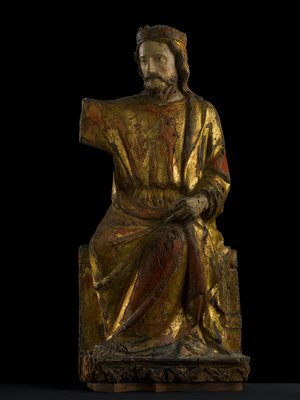 They amassed a collection that focused on late medieval wooden figures from the Low Countries, which still had their original paint or polychrome, but works from Germany or France and enamels from Limoges were also included in the collection with just as much care. Schoufour spent the whole of his life working in the port of Rotterdam and in 2000 he and his wife decided to donate their collection to Museum Boijmans Van Beuningen in stages. Every year the museum was delighted to receive a series of magnificent statues. Schoufour continued to collect after his wife died in 2001. In 2008 an important part of the collection was exhibited in the museum for some months. Schoufour died in 2014. With this wonderful gesture of gifting his entire collection to the museum he was deliberately following in the footsteps of other art-loving Rotterdam shipping magnates. 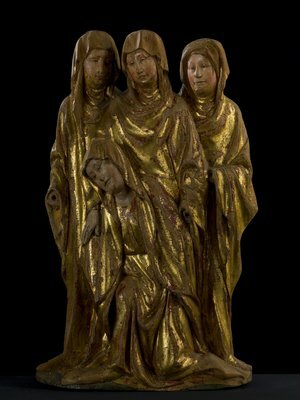 To coincide with the exhibition, a catalogue with in-depth descriptions all of the statues, enamels and ivories in the Schoufour-Martin Collection is being published in Boijmans Studies – a series of scholarly studies about our own collection. The book is financed with funds from Schoufour’s estate, which are managed by the VZW Pater Davidfonds. The catalogue will be on sale in the museum shop and in the museum’s webshop from 9 September. Jacques Schoufour (1927-2014) was a true Rotterdam man of the docks. He started his career at the age of eighteen, working in his father’s stevedore business. He would go on to work in the docks for the whole of his life. When he was twenty-eight he became a director of a company that specialized in the transhipment of coal and iron ore. Together with Steenkolen Handelsvereniging (SHV) (owned by D.G. van Beuningen) he founded Europees Massagoed Overslagbedrijf (EMO), which became one of the world’s largest transhipment companies. Around 1975 Schoufour joined the Thyssen-Bornemisza Group, where he was in charge of the transport and trade division. This often brought him into contact with the famous collector Heinrich Thyssen-Bornemisza, who was then living in Lugano, and whose collection would go to Madrid. 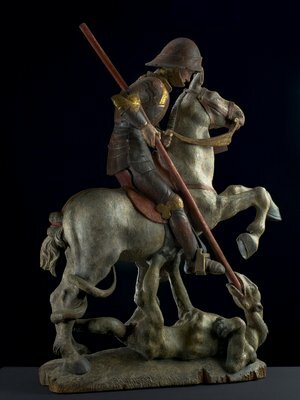 In 1977 Schoufour was given a small statue of St Martin as a gift and he and his wife Ingeborg Martin then discovered their passion for collecting sculpture. 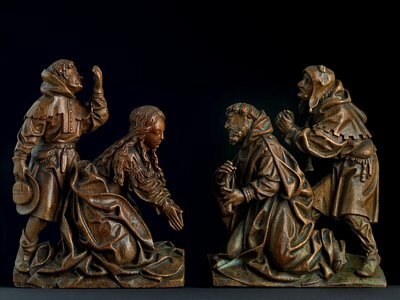 Hewn, Carved, Donated – Medieval Figures from the Schoufour-Martin Collection is on show 9 September to 28 January 2018. Museum Boijmans Van Beuningen is an eclectic, distinctive museum established in the heart of Rotterdam almost 170 years ago. A visit to the museum is a journey through the history of art. Dutch and international masterpieces present an overview of art from the early Middle Ages to the twenty-first century. From Bosch, Rembrandt and Van Gogh to Dalí and Dutch Design. The museum shows the birth of Impressionism and Modernism through work by such artists as Monet, Mondrian and Magritte and has a splendid collection of Pop Art produced by Warhol, Lichtenstein and many others. It also has an extensive collection of style (including fashion) and design, with objects by Breuer, Eames, Sottsass, and Grcic. The Dutch designers represented include Rietveld, Gispen, Hella Jongerius, Studio Wieki Somers. Museum Boijmans Van Beuningen provides a stage for internationally established artists like James Lee Byars, Richard Serra and Yayoi Kusama and contemporary artists such as Marijke van Warmerdam, Carsten Höller,‎ Ugo Rondinone, Sylvie Zijlmans & Hewald Jongenelis and Tal R.